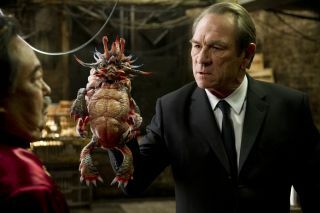 Keone Young (left) and Tommy Lee Jones holding "Spiky Bulba" in Columbia Pictures' Men in Black 3. Despite what the movies tell us, any aliens that visit Earth probably won't want to enslave or vaporize us, veteran E.T. hunter Jill Tarter says. Hostile aliens abound at the multiplex these days, terrorizing our planet in films such as "Battleship" and "Men in Black 3." But science fiction is probably far from reality in its depiction of Earth-contacting extraterrestrials, said Tarter, who announced Monday (May 22) that she's retiring after spending 35 years scanning the heavens for signals from intelligent life beyond Earth. "If aliens were able to visit Earth, that would mean they would have technological capabilities sophisticated enough not to need slaves, food or other planets," Tarter, who is stepping down as director of the Center for SETI (Search for Extraterrestrial Intelligence) Research at the SETI Institute in Mountain View, Calif., said in a statement. Tarter's confidence in aliens' benign intentions puts her at odds with famed British astrophysicist Stephen Hawking, who has warned that extraterrestrial civilzations may venture our way to strip-mine our planet for resources. "While Sir Stephen Hawking warned that alien life might try to conquer or colonize Earth, I respectfully disagree," Tarter said. "If aliens were to come here, it would be simply to explore. Considering the age of the universe, we probably wouldn’t be their first extraterrestrial encounter, either." Tarter, other scientists and a variety of artists and entertainers will gather next month in Santa Clara, Calif., to discuss such issues in depth. SETICon II, held June 22-24, will explore humanity's place in the universe and the future of the search for life beyond Earth, conference organizers said. While Tarter, 68, is retiring from her long-held research role at the SETI Institute, she will continue to devote herself to the search for E.T. She'll fundraise full-time for the Institute, which had to shut down its alien-hunting Allen Telescope Array for seven months last year because of a budget shortfall.